Coaches and team physicians at all levels of sports will soon be able to test athletes for possible concussions using low-cost, mobile tools being developed at UC Davis. UC Davis experts in physical medicine and rehabilitation, sports medicine and neuropsychology provide complete care for all forms of traumatic brain injury from mild to severe. Treatment plans are personalized based on the causes of the injury and specific symptoms. Call 916-734-6805 for information about sports-related TBI (including concussion) treatment and return-to-play evaluations and 916-734-7041 for information on non-sports-related TBI evaluation and treatment. Khizer Khaderi, director of neuro-ophthalmology at the UC Davis Eye Center, has found a way to more objectively determine the likelihood of a concussion by measuring how athletes’ eyes react to specific tests that assess the eye-brain connection. Moore is the principal investigator of a study that began this fall on the UC Davis football field. She is using the device to test athletes immediately after a sports injury and assess how their brain function compares to established norms. Returning to play too soon after a concussion creates risk of more serious injury or even sudden death. 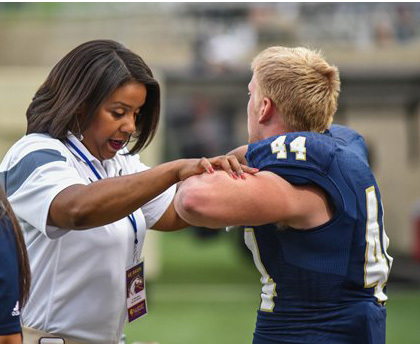 Currently, athletic trainers, physicians and professionals try to detect brain injury in players by having them take balance and cognitive tests prior to the start of the sport season, and then give the same tests at the time of injury. If the player performs poorly compared to his baseline test, then a concussion is suspected. But existing tests are inadequate because a concussion diagnosis still relies partly on the self-reporting of players who may want to return to the game. They can fudge the results by purposely delivering a poor baseline test so that when an injury occurs, their results aren’t too different from their baseline scores. Khaderi and his team have identified three tests that will run on a laptop or tablet platform and can greatly increase chances of accurate on-field assessment. One test gauges eye movement — which often slows after brain injury — and compares it against a baseline that’s harder for players to intentionally throw. Another test measures pupil dilation and function via responses to image-driven psychological tests, rather than by classic flashlight-in-the-eyes techniques that can be skewed by background light. A third metric in the works measures brain waves, or electroencephalograms. “I wanted to create something that was cheat-proof. And to do that, I focused on eye movements and pupil response — physiologic processes that you can’t cheat,” Khaderi says. Measuring eye movement can be accomplished with a $100 eye-track instrument and a laptop or tablet. Khaderi says he hopes to package this test in a cloud-based software application, making it accessible to coaches and team physicians at all levels of play. “We wanted to keep this as cheap as possible in terms of making sure that we can get it into the hands of the people that need it,” he adds. Read the original UC Davis Health System story.